What kind of accommodation are you looking for? The new Hotel Deluxe offers 54 feel-good rooms: from comfy two-bed rooms (which can also be booked as single rooms), to “Family & Friends rooms” with 4 to max. 6 beds. 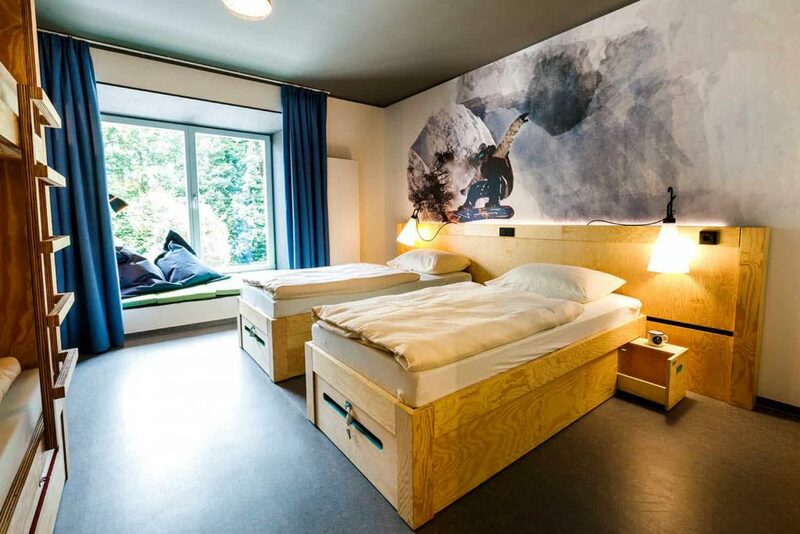 Individual travellers who would like to meet new people or are just looking for good overnight accommodation can simply book one bed in the “Dorm” in youth-hostel style. The dorms have maximum six beds. The question of “with bathroom” does not even pose itself: all the rooms are equipped with bath and shower, toilet and towels. For those guests booking one bed in the dorm, we offer a towel set for 5 euros. Bed linen and W-LAN is included in the price, of course. 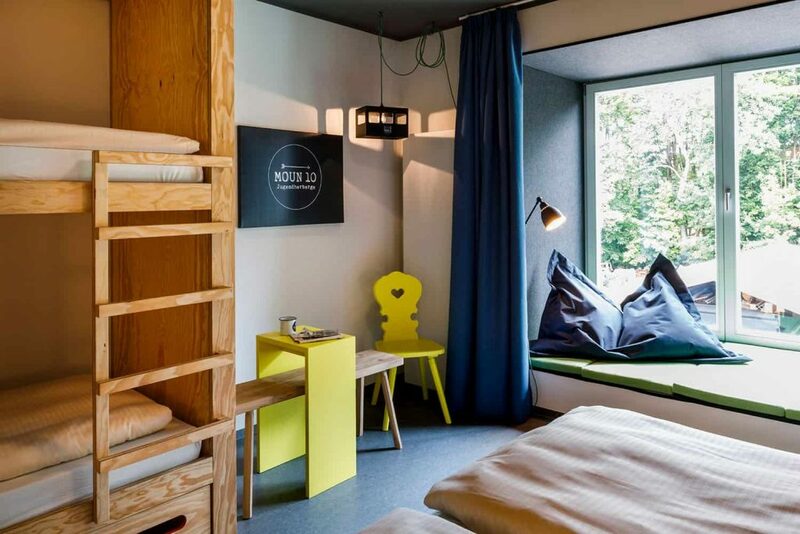 The feel-good rooms in moun10 are far more than just somewhere to spend the night: with their unobtrusive, no-frills, casual design and their spaciousness they are practically an open invitation to stay. Simply put up your feet and enjoy the luxury of an afternoon lie-down – and your own personal space. Or how about burying yourself in a book? Make yourself comfortable in the wide window nooks with thick cushions and reading lamps – and experience your own reading space. The natural material wood, with its beguiling fragrance, is in itself especially relaxing and creates a cosy atmosphere, just right for a relaxed sleep – space for sweet dreams. Our comfortable single rooms offer undisturbed relaxation. The spacious rooms include bathroom with separate shower and toilet. Some rooms have a reading corner with panoramic windows and unforgettable views. Our comfortable double rooms offer accommodation for two persons. The spacious rooms include bathroom with separate shower and toilet. Some rooms have a reading corner with panoramic windows and unforgettable views. The family rooms with their spacious area of up to 31m2 offers you the wonderful opportunity to relax together after a long day in the mountains. 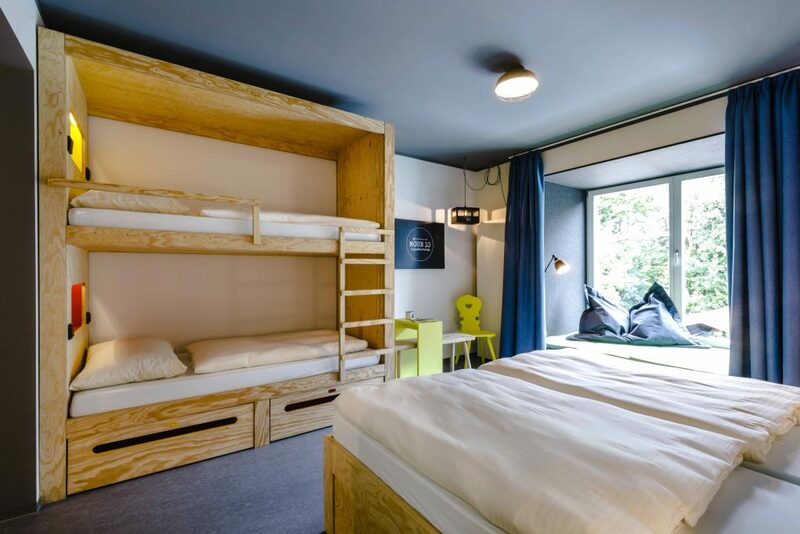 With a double bed (which can be split into two single beds), and a bunk bed, the room offers sufficient space for up to 4 persons. The Dorm is just the right budget-price accommodation for those who have no problem sharing a room with strangers. The dorms have maximum six beds. *All prices exclusive tourism tax. This is charged extra. *Building construction is under way at present on the moun10 site. Construction work, including apartments, parking and restaurants, is likely to be completed in 2021. Since our premises are located right at front of the building construction site, you are not likely to experience much disturbance. However, some views might include not only the mountain view, but also views of the construction site and building cranes.